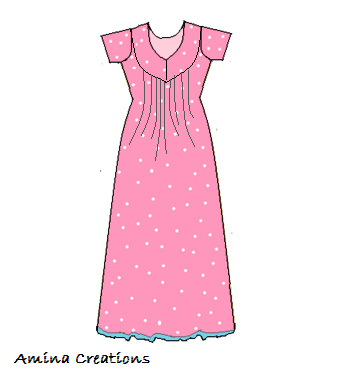 If have already shared a post on How to stitch a nighty and in this post I am sharing a tutorial on how to stitch a nighty with yoke and gathers in front. Using the measurements given below make a paper draft and keep ready. First open the cloth and fold in the reverse such that the two selve edges are on top of each other. Then fold again as shown. You will now have 4 layers of cloth one on top of the other. Now cut the cloth along the fold as shown. You will now have 2 pieces of cloth one for the front and other for the back. 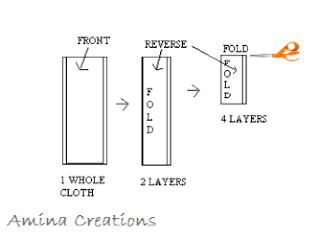 Now take one piece of cloth along with the fold and using the paper draft mark on the cloth. This is for the back portion of the nighty. 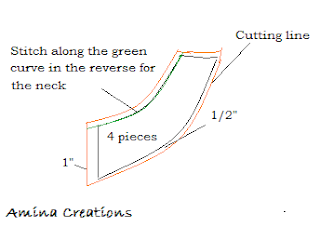 After marking the measurements on the cloth, cut the cloth leaving 2” stitching allowance at the bottom and ½” at the neck, arm hole and shoulders and 1” at the sides. The back portion of the nighty is now ready. For the front portion, draw the yoke curve on the draft using the measurement given below. 6 to 13 = 7"
Extend 13 to a and b through a curve so that the yoke has a uniform thickness as shown. 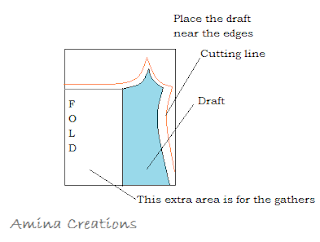 Cut along the a to b curve and your draft for the yoke will now have 2 parts for the front portion. 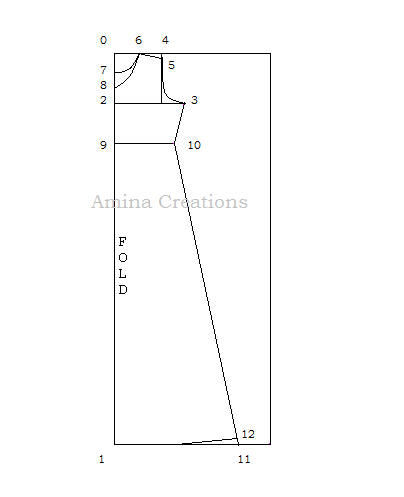 Now take the other piece of cloth, place the lower part of the draft as shown below. 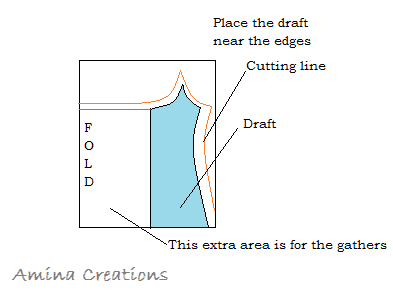 We are keeping the draft near the edges so that we can have pleats at the centre. Cut the cloth leaving 1" allowance along the sides and 1/2" along the arm hole. The remaining cloth after cutting the lower part of the front can be used to cut the yoke and sleeves. For the yoke, we will need 4 pieces of cloth, 2 on each side for stiffness. Take 1/2" allowance along all sides and 1" along the opening. Stitch 2 pieces in the reverse along the green curve as shown and turn to the correct side. Similarly do the same thing with the other 2 pieces, you will now have the two parts of the yoke, stitched and ready. Now for the opening, take one piece and single fold it and stitch and then take the other and double fold it and stitch so that one part will now close the other. Once the yoke is done, we can attach it to the lower part of the nighty. For this pleat the extra cloth with equally spaced gathers and stitch it to the yoke. Once done we can cut the sleeves. For the sleeves, use the construction given below and cut the sleeves. 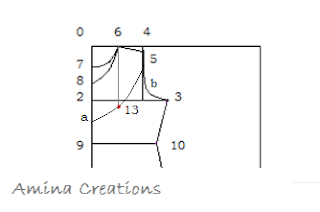 Check out how to stitch a sleeve for the method and diagram. 0 to 2 - 1/12 chest + 1/2"
2 to 3 - 1/6 chest + 2"
1 to 4 - 1/2 round arm + 1"
Now start by stitching the front and back pieces at the shoulders. Then attach the sleeves to the arm holes. Once done, stitch at the sides starting from the sleeve ends all the way till the bottom. Double fold the cloth at the bottom and stitch. Turn the cloth to the reverse and overlock the edges so that the threads do not come out. Your nighty with yoke is now ready.